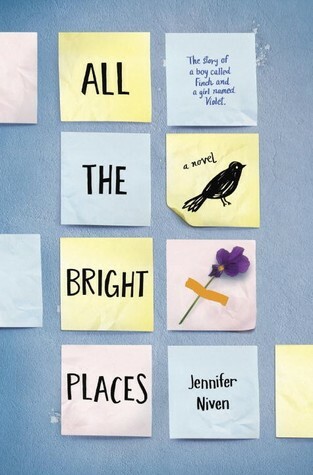 As far as grabs for readers thirsty for more John Green go, All the Bright Places is a well written book. All the hallmarks of Green's books are there: endangered love, quirky misfit teens who love to read, parents who don't impede with the teens' lives, a weepy ending. Fans of The Fault in Our Stars will love it, the same way fans of The Hunger Games enjoyed The Testing: it's not as good as the original, but it's better than nothing. I listened to it on audiobook, so it went slower than just straight reading. As we built to the finale, I wondered, will the author really have our manic depressive protagonist commit suicide? What does this mean for young readers with the same issues who read the book? While there was plenty of hope for Violet, our heroine, I wish that there could be a happier ending for Finch. I don't wish it for Finch, so much as for young readers who are grasping for a way out. It's too mature and dark for my students, but with a movie starring Elle Fanning coming out, I bet some of them will be interested. I'll tell them to wait a few years so that they can enjoy it.